The title sounds easy enough right? I’m talking about easy steps for making chicken milanese aka breaded chicken that is fried or baked or both! It can get messy but it’s a simple 3-step process to bread chicken: first you lightly cover the chicken with flour; then you dip it in egg; lastly, you coat it with bread crumbs. Once you finish breading and frying the chicken, you can get creative with your toppings. 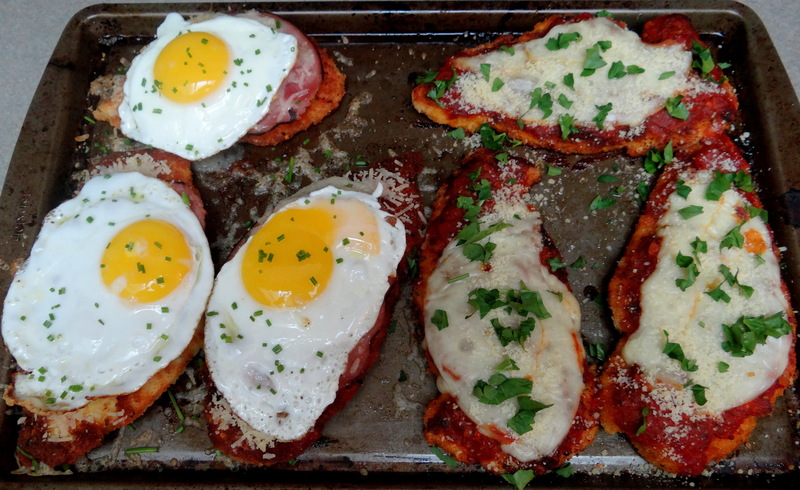 Take for example this delightful recipe from A Cozy Kitchen for Chicken Milanesa, Uruguayan Style. The breading has more of a kick and after the chicken is fried, it is topped with a slice of ham, shredded mozzarella & a fried egg. Can you say YUM! For the other half of my chicken breasts, I decided to add marinara & cheese aka chicken parmesan. Same breading process but after frying the chicken, I topped the chicken with grated parmesan cheese, marinara sauce & a slice of provolone. You can add as much cheese & marinara as you want. Pop the chicken in the oven until the cheese has melted and sprinkle with parsley. 1. Place chicken thighs between two sheets of parchment paper or plastic wrap. With a mallet or bottom of a small heavy pan, pound until the chicken is 1/4-inch in thickness. Repeat process with second piece of chicken. 2. Add the all-purpose flour to a plate; set aside. In a bowl, beat together 2 eggs with 1 teaspoon of salt and 1/4 teaspoon of pepper. On a plate, toss the breadcrumbs with 1 teaspoon of salt, crushed red pepper flakes and paprika. 3. Heat 1-inch of vegetable oil in a cast iron skillet over moderately high heat. 4. Lightly dust both sides of the chicken with flour, being sure to brush off any excess. Immediately dip into the egg mixture, allowing any excess egg to run off. Then transfer the chicken to the breadcrumbs, coating both sides evenly and pressing the bread crumbs into the chicken so they adhere. Repeat process with second piece of chicken. 5. Gently place the chicken in the hot oil, cooking on each side for about 2-3 minutes and until golden brown. Cook the second piece of chicken the same way and transfer both them to a baking sheet. 6. Using the same hot oil, fry up 2 eggs and set aside. 7. Top each piece of chicken with a slice of ham. Place 1/4 cup of shredded cheese atop both pieces and place under a broiler for 1-2 minutes, and until cheese is lightly browned. Gently transfer fried eggs to the top of the chicken and serve immediately.